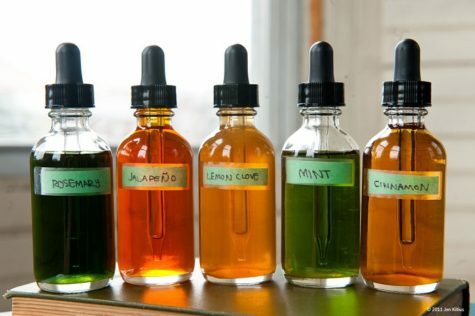 Tinctures are concentrated herbal extracts that are made using alcohol and chopped herbs. The tincture is especially effective in drawing out the essential compounds of plants, especially those that are fibrous or woody, and from roots and resins. Since this method ensures that the herbs and their nutrients can be preserved for a long time, it is often mentioned in herbal books and remedies as a preferred way of using herbs. The container for the tincture should be glass or ceramic. Never use a metallic or plastic container because these can react with the tincture or leach dangerous chemicals over time. 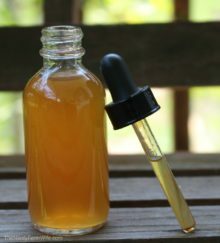 Items such as a mason jar, a glass bottle with an attached stopper, etc., are ideal for steeping a tincture. You will need to get some small dark glass tincture bottles for storing the tincture in once it has been made; these bottles should have a tight screw-on or tight clip-on lid to prevent air intrusion during storage but to allow for ease of use. Ensure that all containers are both washed clean and sterilized prior to use. Add enough fresh chopped herbs to fill the glass container. Add 113g of powdered herb with 473ml of alcohol (or vinegar/glycerin). Add 198g of dried herb material to 1 liter of alcohol (or vinegar/glycerin). Using a butter knife, stir around the edge of the glass container to ensure that all air bubbles are released. Seal the container. 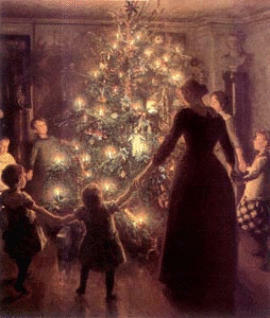 Place it into a cool, dark area (in a cupboard). The container should be stored there minimum 8 days to a month. Shake the container twice a day. Be sure to label the steeping tincture so that you know what it is and the date on which it was made. Keep it out of the reach of children and pets. Place cheesecloth across a sieve. Place a large bowl underneath to catch the strained liquid. Gently pour the steeped liquid through the lined sieve. The cheesecloth will capture the plant material. Press the herb material with a wooden spoon to squeeze out some more liquid, and then twist the cloth to extract any leftover liquid. Decant the liquid into a prepared tincture bottle. Use a small funnel for this step if you don’t have a steady hand. Tighten the lid and date and label the tincture. A tincture can have a shelf life of up to 5 years because alcohol is a preservative. 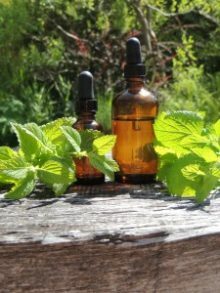 However, know the properties of the particular herbs you’ve used, and follow the guidance of the recipe from which you’re making the tincture in terms of how long to keep the tincture for. Follow the instructions relevant to your tincture for usage; consult a qualified, reputable herbalist or a health professional if you need more information and bear in mind that herbal treatments can be dangerous if you don’t know the properties of the herb and its consequences. This remedy is especially helpful for those who are prone to headaches that stem from indigestion. 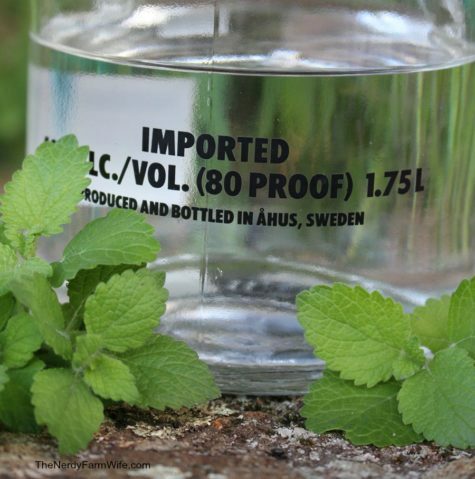 Cover herbs with alcohol in a jar or bottle & leave closed in warm dark place for a 2-4 weeks. Strain.Bottle again. Take ¼ – ½ tsp before and after meals.